In this episode of Living Upp’s Conversations with Smart People, I interviewed Leanne Kabat of MamaConnects about how moms can invest in themselves so they can make a meaningful contribution to their families and communities. Q: What exactly is Mamacon, and how did you become involved with it? Leanne Kabat: MamaConnects is a community of moms celebrating and navigating the complex journey of motherhood together. It is designed to support moms in all seasons of motherhood, whether your children are younger, tweens and teens, or grown and flown. MamaConnects hosts events for overwhelmed and overextended mamas, providing strategies so we can be our best for our children, partners and ourselves. MamaConnects is built on three pillars: pampering, inspiration, and enrichment. We honor these pillars in our face-to-face meetups by showcasing inspiring speakers to nurture our minds, spa treatments to nurture our bodies, and intentional girlfriend time to nurture our souls. I was alone and shy, sitting in the back corner watching from a safe space, but I couldn’t help but get swept up in the emotional sharing and side-splitting laughing of the speakers on the stage and the women around the tables. After that event, I wrote to the founders and pleaded with them to let me help bring this experience to women every year. We worked together for four years, and when the company went up for sale this past May, I jumped up and down until it became mine! 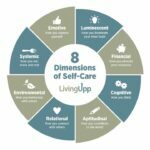 Leanne Kabat: To me, self-care means making intentional and deliberate choices to create a thriving life. This definition truly encompasses my every breath. Am I choosing nutritious food to eat? Am I setting limits in my volunteer and work commitments? Am I both moving my body and resting my body enough? Have I dedicated time for creative expression and human connection? Do I forgive? Do I reflect? Do I monitor my energy and refill myself as needed by walking in nature, meditating, making plans to travel, reconnect with people I love? Q: I just read your story and I now find you even more amazing! (And quite honestly, you were already pretty amazing to begin with!) You’ve gone through some significant health concerns of your own. What has helped you move through it? Leanne Kabat: Thank you! There is something that happened deep in my DNA that November day in 2006 when my neurologist sat with me and told me I had only five years to live after I suffered from what I affectionately call ‘my stupid bloody brain crash.’ After six months of testing by dozens of specialists, no one knew why I fell down, 5 months pregnant, and remained paralyzed for hours. No one knows why I spontaneously start to slur, or see pink neon flashes shoot across my eye, or have crushing head pain that blows through me and dissipates within minutes. Over the years they have poked, prodded, scanned, and measured the extent of my brain damage and identified tasks that will be more difficult for me based on the areas of the brain impacted by my condition, but it remains a medical mystery. They had lots of great theories, but none of them turned out to be true. It was in the depressed fog of watching each day slip by as I edged closer to my time of death that I honestly just decided I was going to live. I had three children who needed me and I wanted to be their mom more than anything in the world. For the next few years, I still watched the calendar and my 5-year expiry date, but I was pulling myself out of the hole. I made it past the five-year mark, then past 6, then past 7! In 2012, I had joined an amazing team of women at MamaConnects, this empowering conference for moms, and suddenly my life changed to become full of potential and possibility. I remember in an appointment in 2013, my neurologist showed me my latest brain scan. As was our routine over the past seven years, she showed me the progression of damage, and I crumbled emotionally, falling deeper into despair. But this time, I challenged her on what she couldn’t see. I told her these scans can’t measure my drive for making a difference. They can’t see how I wake up every day full of love for my kids and my family, exploring the world through their eyes and giving them new opportunities every day to see how beautiful and magnificent their life can be when they stop and smell the roses and meet new people and climb trees and take chances. These scans can’t see how passionately I want to serve stressed, tired, scared, frustrated, consumed moms at our conferences. They can’t see how I sparkle when I bring joy, laughter, or new ideas to my friends and family. At the end of the appointment, she wiped away her tears and said I was her miracle. I laughed and shook my head. No, I replied, I was just living in my miracle. My blessed life. My every day was my miracle. She loved that I chose to live, chose to ignore the expiry date and cheered when I set new goals to achieve, such as my 50 by 50 goal- visit 50 countries by the time I turned 50. Next month, on my 10-year anniversary of that conversation with my neurologist, I will have been to 35 countries around the world. So, for me, honoring the gift that I can serve my MamaConnects moms by creating a community that shares and cares about each other, bearing witness to their motherhood journey and offer support when it all becomes too much – that drives my professional passion. Honoring the gift that I can serve myself and my family by exploring this great, glorious world, experience all of life’s gifts, and live in our miracle – that drives my personal passion. Q: What would be your advice to the moms out there who are struggling with taking proper care of themselves? Leanne Kabat: Self-care could mean a long shower for one woman and a spa retreat for someone else! Or for one woman, it could mean having time every day to read a book with a cup of tea, while for another she would choose to train for a marathon or knit a sweater while listening to jazz music. I believe self-care has two critical components: identification and practice. The first thing every woman should do is identify the ways she wants to recharge. This is very personal and self-reflective and it is different for every woman. She can’t just Google ‘self-care practice’ and do the top tip hoping for the best! After she knows what she wants, she must choose to find a way to make that happen, the practice piece. Perhaps for one woman, the best self-care would be to dance, but she doesn’t have the money to pay for expensive classes. That isn’t the end of the road for her though! She can find lessons on YouTube or maybe take classes at the local YMCA or community centers. Another woman dreams of writing poetry every day to deal with the loss of her mother, but she doesn’t have the time with her busy life. She could decide to wake up thirty minutes earlier and write, or download a recording app and speak her poetry and write it out another time, or she could decide that every day for 15 minutes, her children will sit with her and they can silently read or draw while she writes poetry and they can turn it into a family activity where they can share their work afterwards if they like. So, there are no rules for what self-care needs to be, what matters is that every woman purposefully and powerfully chooses what it is for her, and finds ways to honor herself to recharge. No one can pour into someone else when her cup is empty! Self-care is the only way to healthfully refill her cup. Q: What has been the most rewarding aspect of being involved with Mamaconnects? Leanne Kabat: By the time I turned 35, I had moved to a new home over seventy times and I had attended 9 schools from grade 1-12. To say I didn’t have roots would be an understatement! I had made and lost so many friends growing up that at some point I just didn’t bother making friends anymore because I knew I wouldn’t be there very long. So I was always polite, but my friendships always stayed on the surface; they never became a space where I could be my true self, reveal my inner thoughts, talk about my mistakes or my struggles, or feel safe to be vulnerable in any way. When I attended the first MamaCon conference in May, 2012, I stood with my mouth hanging open the whole day! I never knew women could gather and connect and share and support so openly and freely with people they didn’t even know! In both table discussions and big groups, they revealed their personal stories, hardships, struggles, small wins and big successes – they shared everything! It was life-changing for me to witness a sisterhood so beautiful and powerful! From that day, I knew I found what I had missed my whole life: my tribe! I am completely humbled that I am now leading the MamaConnects movement to connect women, to share journeys of motherhood and womanhood, to rise up to be our best selves surrounded by and encouraged by fellow nurturers and protectors, pioneers, warriors, trailblazers and community builders. For me, the most rewarding aspect of being involved with MamaConnects has been that no matter how high the mountain or how low the valley, we are never really alone. We are a part of something bigger and greater, a collection of hearts full of strength and power and love, and we are in this together. Inspired a little? We’d love to hear what you think. Please share your thoughts in the comments below. To learn more about upcoming events, visit the Mamaconects website, or get connected on Facebook and Twitter. This entry was posted in Conversations With Smart People and tagged relational, serving others.